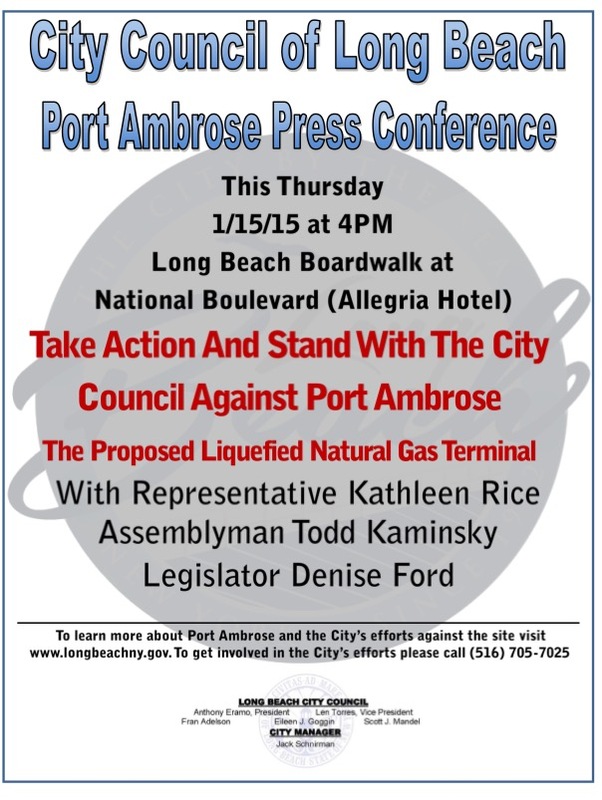 The Long Beach City Council encourage you to come out to the Press Conference Against the Port Ambrose LNG Facility. Long Beach Boardwalk at National Blvd (Allegria Hotel). in their unanimous opposition against Port Ambrose, the proposed liquefied natural gas (LNG) site off the coast of Long Island. Please share this information with friends, family and neighbors. 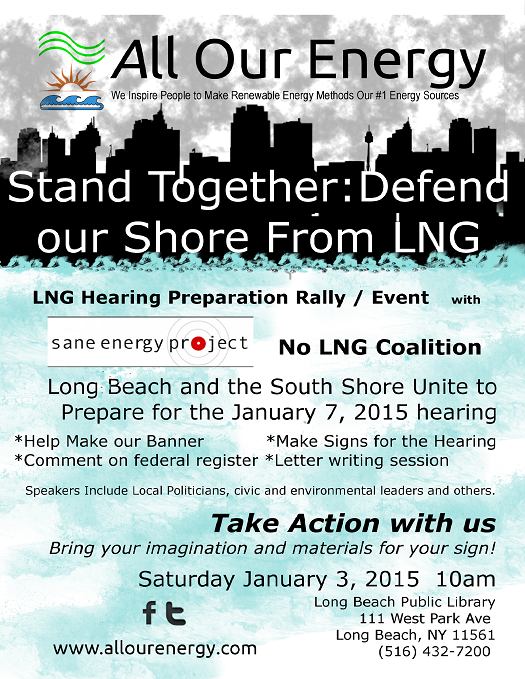 Port Ambrose Liquefied Natural Gas (LNG) Port: the project no one wants didn’t go away. it’s back on the docket. This event on 1/3/15 is to enable people to take action, draw wider attention to the issue, help people to share the information, garner more attendees to the hearing. The 30-day notice of public hearing and public comment period fell during the holidays, obscuring public awareness and scrutiny. We will draw attention to the issue, help people share the information, and facilitate residents to act, comment, organize and then attend the sole hearing on 1/7/15. 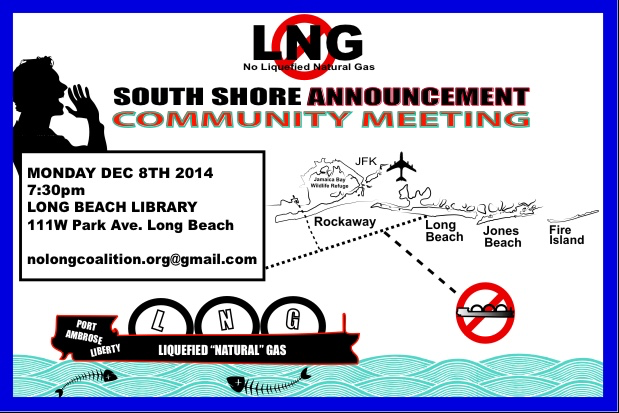 With the threat of a newly revitalized approval process looming, The Long Beach City Council has unanimously decided to officially and publicly oppose the Port Ambrose Liquefied Natural Gas project proposed off Long Beach and our Barrier Island. Back then, on very short notice, the sole public hearing was scheduled to coincide with the 4th of July weekend. Public outcry did force the date to a more accessible time a week later. 400 people went to speak against the project. .
17 comments were lodged In Favor of the project. Sometime shortly after that, the company’s paperwork was so atrocious, the Maritime Administration took the unheard of measure of “stopping the clock” on the project’s approval timeframe, instead of rejecting the project. The company seems poised to return to continue the process where they left off. Opposition is building once again in anticipation of that. The final in this LNG series. These are the last days to make Public (YOU) Comments to the Maritime Administration by Thursday August 22, 2013. Remember : you have every right to make your voice heard. Tell them no! Comment to the regulators on the project’s official government docket by clicking here by 8/22/13. To see a synopsis of what was said and quotes from numerous speakers at the hearing click here. If we are supposed to sacrifice these things in the name of something; some kind of benefit to ourselves, our community, our country, or mankind; no one has said what that benefit is. Liberty Natural Gas is a fracking company / hedge fund based out of Calgary Canada with finances in the Cayman Islands – that is their business. as the company yawned and said they’d get around to solving it in a few days. Please can we get a pretty rainbow sheen for our waters, too? That one they don’t know how to fix yet. Same problems as the BP oil spill -blowouts and capping problems. I wonder about all the ones we’re not hearing about! Cold Lake oil spill leaking for months: Documents. The same thing happened in the Exxon Arkansas neighborhood spill. The company said it was too dangerous to have civilians and reporters in the area or helicoptering overhead so police and private security kept them out. Environmental roulette so the few can get rich and cut and run in a disaster. If they’re caught, there is no criminal penalty and the fine is so small it usually amounts to a couple hours profits for these companies. 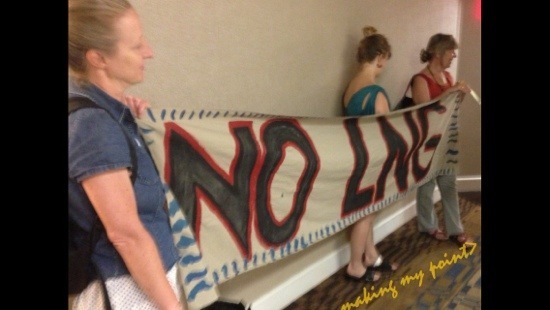 Pipelines and public lands – a bad connection! I have found this industry article saying there is a connection between this project and the pipeline being jammed through the Rockaways, Brooklyn etc. so why isn’t the company forthcoming on this? Will Jones Beach State Park be next? It seems like its a real coincidence. Everyday, our beach has garbage wash up on it. Soda cans, tampon applicators, plastic bags, balloons are guaranteed -daily. 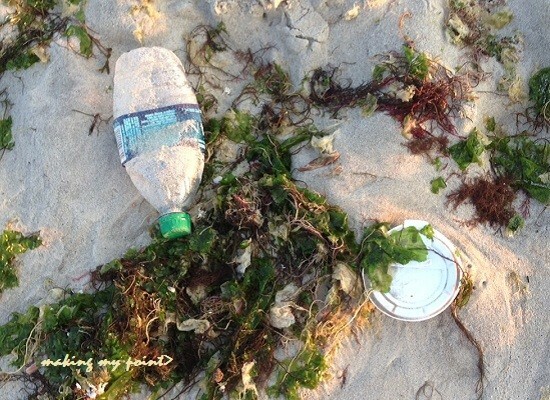 just everyday garbage that washes up on our beach. you think this project won’t add worse stuff to this? Where does all the garbage come from? Much is from garbage barges that are 10-20 miles away. We are foolish not to expect to see the effects of this project washing up regularly. And even scarier would be all the things washing up that you can’t see! 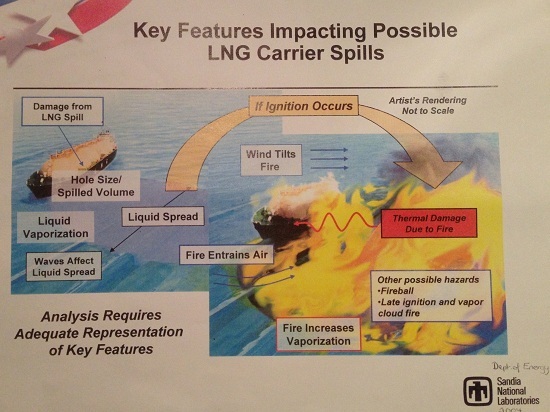 I took some flack over my fictitious story about the LNG tanker exploding on other blogs etc. I even merited my first “wacko”(bows) and I’m going to show you this picture that was made available to me that I am not far wrong. As you can see from this diagram from Sandia National Laboratory, THEY say this is a potential disaster and needs to studied. An interesting speaker spoke at the hearing about this very subject saying the industry has only studied pin size holes in gas lines. There are no studies on a breach of the tankers hull. Another speaker, an attorney for Suffolk County said in her research into the last LNG port, she was given a copy of the Maritime college textbook which claimed that if an entire LNG tanker exploded it would be powerful enough to “knock the earth off its orbit”. And here I thought I was just taking things a little too far in making my point! Maybe I didn’t go far enough. Thanks to CONCA (The Coalition of Nassau Civic Associations) for coming out AGAINST the project, forcefully. Read the letter at the link at the top. Time is running out whether you decide or not, others are going to make their decisions. Geddy Lee and Alex Lifeson reminded us that “if you choose not to decide, you still have made a choice”. Make a statement on the official government regulators’ docket against the project on the links above. I can’t stop you from copying and pasting that excellent letter from CONCA into those comments and adding your two cents… Just saying. You can also find the Surfriders link here that will supply a downloadable opposition letter for you to make the case. It is obvious this is not going to be just our politicians or civic associations’ responsibility to do something about this. Please. Click the links above to let the government and everyone else know we do not want this. Please. share this with everyone you know using the buttons below for email and social media. Lets make people aware, lets unite and be heard. 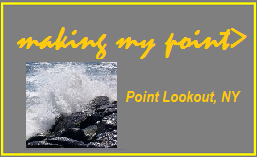 CONCA, (The Coalition of Nassau Civic Associations), the largest association of Nassau County civic associations, to which Point Lookout Civic Association belongs, has come out against the Port Ambrose LNG Terminal off our shores. 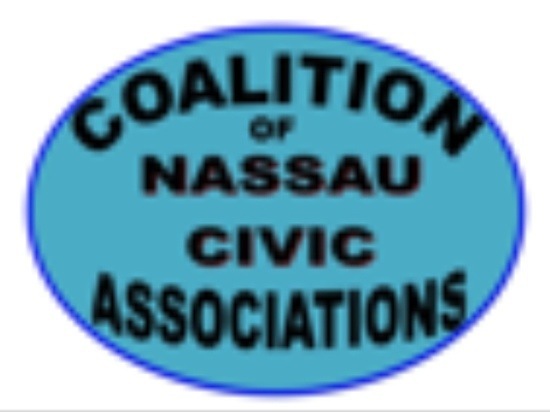 The Coalition of Nassau Civic Associations (“CONCA”) is comprised of multiple civic associations, representing hundreds of thousands of respective resident-taxpayers, located in Nassau County. First is climate change. Due to global warming, severer weather events are being forecasted for Nassau County, and more frequently. Keeping in mind Nassau’s south shore is still struggling to rebuild after Superstorm Sandy, situating Port Ambrose less than 19 miles south of Nassau County would stress communities to the breaking point if the facility was damaged by another extreme storm. Second is security. In recent weeks, LNG facilities in Yemen were reportedly on Al Qaeda’s target list. Port Ambrose’s proposed location is at the entry of New York Harbor. Given the U.S. Coast Guard’s drastic funding and personnel cuts, this poses a security threat to the entire region. Simply, Nassau County’s southern coast could not be assured adequate protection if reassigned USCG vessels were forced to undertake the full-time job of guarding LNG tankers coming in and out of NY Harbor. If there was a terrorist attack on Port Ambrose or the facility was damaged by an extreme storm (or otherwise ruined), the domestic natural gas currently feeding Long Island would be severely compromised, possibly causing Nassau residents and businesses to lose their entire supply. Third is intent. Perhaps of greatest concern is not that Liberty intends to import natural gas to Long Island; but rather the technical ease in which it can convert Port Ambrose from an import to an export facility; requiring only written permission, but neither a public hearing nor comment period. In addition, the process of liquefying our domestic natural gas has become conveniently simplified in recent years, to the point where it can be effected on board ship. Like water, natural gas is a local, natural resource. Also, our supply is not infinite. It is indeed limited; and should neither be owned nor mined by a foreign company to be sold outside the U.S. CONCA’s concern is Liberty will hasten domestic depletion at the expense of current and future generations. And, as the demand for natural gas grows overseas, exportation is sure to increase as well. Already, licenses have been issued to export 40% of all the natural gas mined in the United States. The bitter irony is as overseas energy markets profit, Nassau will not reap any of the benefits, financial or otherwise. In fact, by depleting our own inexpensive, domestic supply, we will be increasing its price here on Long Island. Evidence shows exporting natural gas will increase the cost to heat our homes, as foreign energy enterprises reap massive profits overseas. 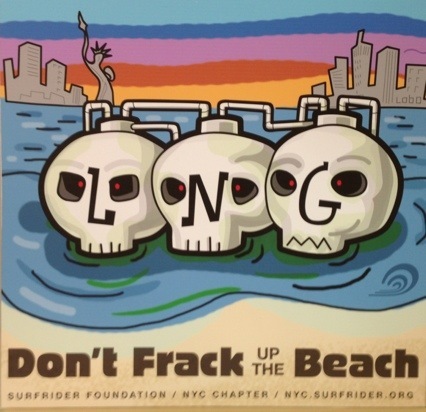 Fourth is hydrofracking, which CONCA deems an environmental death sentence. Given natural gas is in great demand and will fetch much higher prices overseas, the Energy Information Administration has already predicted record setting production rates; and the most financially expedient way to satisfy this accelerating demand is hydrofracking, the fastest and cheapest method of mining the resource. If NY State were to lift its current ban on hydrofracking, this would, in effect, free the energy companies, allowing them free reign to contaminate the land; pollute ground and drinking water; and change the State’s landscape forever. And, since they will require a terminal to export the gas, the Port Ambrose facility will satisfy their needs and facilitate their ambitions, including justifying over-mining the resource and advancing hydrofracking in NY State. Lastly, alternatives to fossil fuels must be aggressively pursued to assure our future welfare. Advancing natural gas production for sale in foreign markets is not in the best interest of Nassau County nor the Country. Therefore, CONCA, on behalf of the multiple civic associations and myriad resident-taxpayers it represents, requests the Maritime Administration deny Liberty Natural Gas any and all permits to construct Port Ambrose off the south shore of Nassau County. Your skepticism is there. It’s just a bunch of environmentalists, you say. This hearing was about the size and scope of the Environmental Impact Statement (the EIS). This is a huge hurdle every project like this must face. Of course they would like to face it with as little opposition, information, and scrutiny as possible, while limiting the sphere involved. These environmentalists keep talking about export and hydro fracking for natural gas which have nothing to do with this and are separate issues. It is only a separate issue if the port is actually used for imports. Imports cost much much more than current US prices, so economically, for the foreseeable future, this cannot be. If the scoping is limited to “just imports” then all that is in the environmental impact statement (EIS) is the near area of the buoy and the pipeline where they connect and the vulnerability of the tanker. You do not have to consider where the gas is coming from and thus the environmental impacts of global warming and pollution of air, land, and water that the extraction of that gas will cause. “It’s called an import facility right now. But the economics on their face dictate that this is really, ultimately, for export,” John Burke, a finance professor at Monmouth University, said. In Europe, natural gas is $9.92. In Japan and Asia, it’s $17.71. I know, it is hard to reckon ones own energy use, to consider where our “clean natural gas” is coming from. It’s no longer clean and highly debatable if its even better than coal anymore. Yes it burns 40% “cleaner”. That’s if you only look at the burning and do not include leaked gas and the pollution fracking causes. Escaped, leaked, unburned gas is a super-potent greenhouse gas -“100 times more potent in the first year, 72 times more potent after 20 years and 25 times more potent after 100 years” (check out the science and factual information at http://www.edf.org/methaneleakage) . If just 1% escapes into the atmosphere you are at break even with coal ( epa & industry -not enviros – says its 2.4-3.6%) and then the destruction and lack of accountability involved in extracting it is appalling. All evidence points to water pollution being a major side effect of this hydrofracking. All the other places it’s going on are facing it. That this is in the area that is the watershed (where all the drinking water collects from hundreds of square miles into reservoirs) for the drinking water for 15,000,000 people from upstate New York to New York City and below, is insanity. Over 200,000 (and rising) NY residents have spoken out to try to stop NY from becoming the fracking wasteland PA has become. The average joe in PA did not get the riches they were promised. In fact, many have lost everything as industry has left the state devastated, their drinking water wells contaminated, gas and land stolen by “slant” and “horizontal” drilling and land taken outright by public domain laws. Not sure why some people keep forgetting they have been referred to as “the little people” by this industry. Today, people in depressed upstate NY areas are being fooled with those same promises. Governor Cuomo has only slightly bowed to public demands. He has left the openly pro- fracking head of the Department of Environmental Conservation (an oxymoron if ever there was) in charge of the environmental review. He says he wants to hurry up and issue licenses before any regulations are imposed! The DEC head sees dollar signs for himself as a geologist (his background) in there. He’ll privatize himself a 7 or 8 figure position with a private drilling company or hedge fund, which is what Liberty Natural Gas really is, as soon as this goes through. Mark my words. He has the inside info on all the locations and all the competition. The fracking moratorium to consider health impacts. so an environmental review can be done and fully completed before the state is opened up for fracking. It’s been ready for a vote for over six months. It’s not a majority, many Republicans are ready to vote for it. The environmental groups have pointed out that once this license is approved for export, all it will take is a request letter from the company to the Maritime Administration, under the “Ports Act”, to amend the license. They say it has already been done for another site, this year, under the very same Ports Act rules this application is under, in the Gulf of Mexico. Import facilities had their license changed to export by simply a letter requesting it. The federal rule / law applies the same here. The precedent is already set. That’s it! There will be no further public hearings necessary to switch to export. Now you would have an export facility that there did not need to have the proper environmental impact statement and public review done. That real EIS for export would have to take into account what is called the “upstream” effects. The fracking that will be going on in New York State would have to look at ruining the drinking water for 15 million people in turning the state into not just an economic wasteland but environmental wasteland. Now it is totally side stepped with no oversight or control by the public. You don’t think those upstream effects matter for us? Dont forget, to boat off the gas, it must be liquified, at sea, by chilling it to -260 degrees farenheit in experimental equipment 19 miles out at their buoys. To accomplish that they will burn off a significant amount of natural gas to accommodate the creation of such a massive scale hyper industrial freezer. The pollution and exhaust of that would be ours, to blow in on the sea breeze right at us. Possibly 24 hours a day, 7 days a week, 365 days a year. How’s this for insanity: Fracking waste water is hard to get rid of. No one wants the chemical and radioactive water. The fracking industry wants laws to allow fracking waste water to be legally sprayed on road surfaces statewide – They want to use sprayer trucks to drive down the road and highway spraying it on the road- Seriously! If It weren’t for the same environmentalists, we would be accepting fracking waste water at our already battered wastewater treatment plants like Bay Park! These plants are unable to treat it, so essentially the chemicals in it would go straight into our bays and ocean. The law used to say they had to take it. This was stopped by these same environmentalists, as that loophole was left open until the public outcry pushed Nassau legislators to close it last year. If you make your voice heard it does make a difference! How do they expect they can roll over the public. They know they can fool a few people who otherwise would be against this, who think they’re going to strike it rich on their land or see cheaper natural gas come rolling in in tankers. It’s just not possible, not for the foreseeable future! Its the classic con. The original film flam. It works by exploiting the mark’s greed or entrenched beliefs. They know a few crumbs of the billions in profits is enough to buy any politician. Looks like the top people are on board. Hopefully you can see the connections to other issues and why this issue extends beyond the limited scope the company is pretending to talk about and why the seemingly outside issues of “export” and “fracking” matter. Makes no financial sense except for export which will raise prices, create possible local shortages, and and cause other pollution we will have to deal with. There’s no contingency, terrorism or emergency plan even necessary! We get no benefits, just all the risks. and your drinking and ocean water. They do not stand to make money or any other personal gain on your back. The worst they can be is wrong, and nothing bad happens. Please take a few moments and make your opinion heard by using the links at the beginning of this post. A heartfelt, personal appeal may be meaningful, you never know!